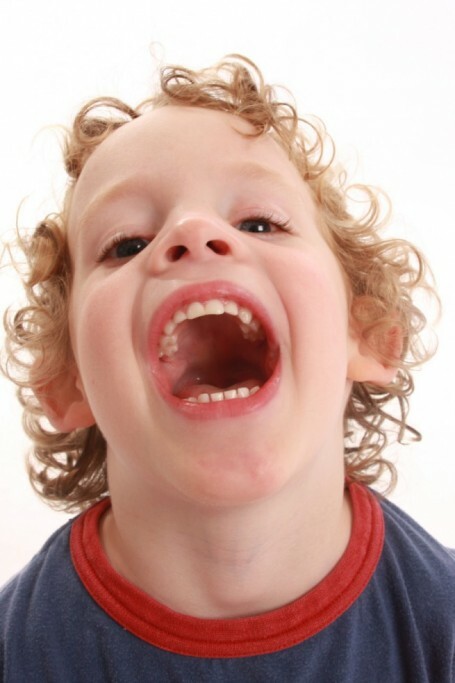 Children typically begin getting loose teeth in between ages 6 and 7. When the first tooth starts to wiggle, it marks your child’s first steps on a long journey. The last adult teeth (wisdom teeth) usually arrive anywhere from 17 to 21. This means for a decade and a half, growing, losing old teeth, and maintaining a clean mouth is very crucial. This will facilitate the transition from a child’s mouth to teeth they will (hopefully!) have forever. New teeth growing in and old teeth falling out means that a lot of drastic changes will be taking place inside your child’s mouth, even if it is spread out over a few years. To reduce chances of infection and decay, be sure to be adamant about them keeping up on brushings, flossing, and dental appointments. 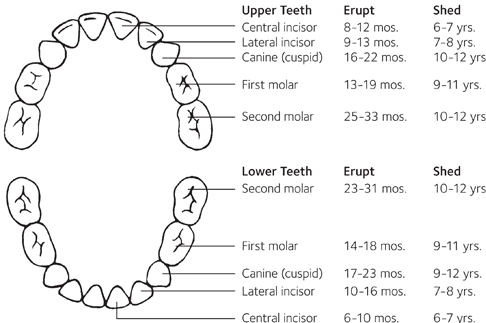 There are 20 baby teeth that arrive in totality typically by age 3, and remain for roughly two years. 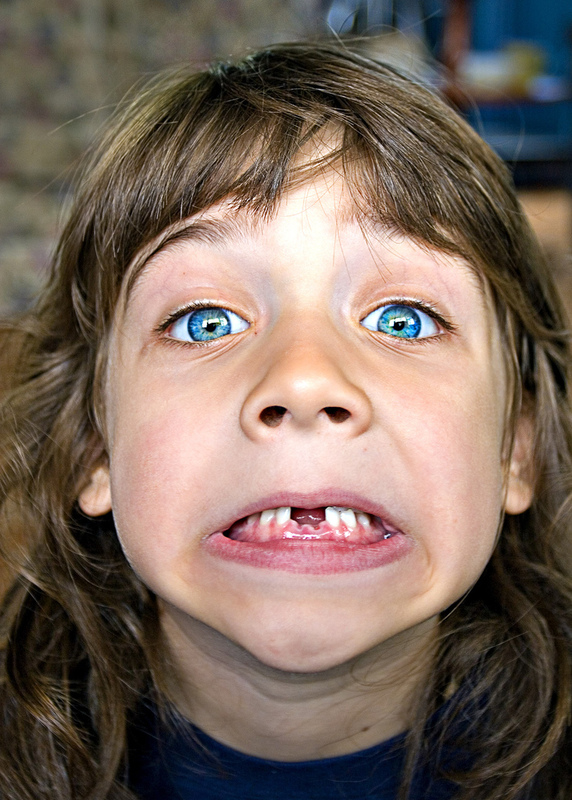 Age 5-6 is the prime age a child will discover their first loose tooth. If this occurs before age 5, this is nothing to worry about, as some kids are just early bloomers. However, if teeth continue to loosen and fall out at this age, consult a dentist to ensure there is nothing wrong. Most children will have lost all by age 12, but once again, this age is not indefinite. The last teeth to arrive are the third molars, also called wisdom teeth. While these to not arrive typically until late teens, these may have to be surgically removed depending on how they affect surrounding areas. The prospect of losing this many teeth in a few years can seem scary to a child; especially one that is very sensitive or does not like change. The best thing to do is ensure them that it is a totally normal thing (and although they won’t remember teething, it is not really more painful than that!). The good news is that, because children all begin losing teeth at around the same age, they will be having the same tooth loss-experiences with their peers and be able to swap stories; making the experience feel that much more normal. 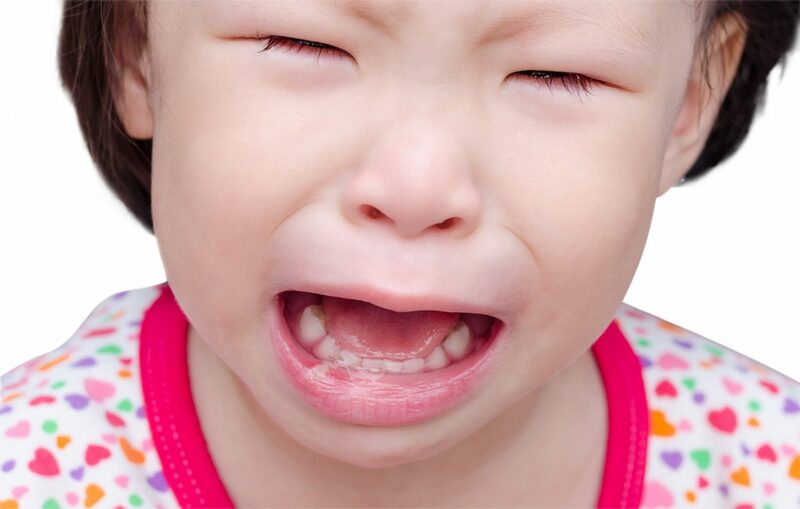 Baby teeth fall out typically in the same order they grew in. This usually begins with the bottom front teeth and then move on to the top front. The general rule of thumb is that roughly every 6 months, 4 teeth erupt to the surface of the gums. 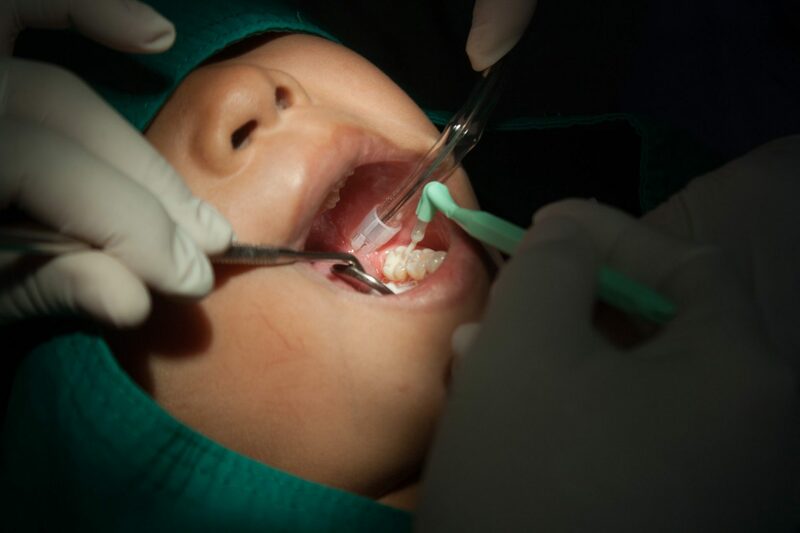 It is recommended however that you or your child does not FORCE a tooth out before it is ready. While a baby tooth being knocked out isn’t the worst thing that can happen (as an adult tooth will eventually grow in its place), it can expose sensitive tissue which can get infected. Definitely encourage wiggling and moving the tooth around, as this will slowly relax the tissue around it and enable the tooth growing behind to glide gently into its place. So give up old tricks try tying dental floss to a tooth and a door! Be patient, wait for the tooth to loosen enough to where the adult tooth is just beginning to emerge. This will make the transition faster and smoother. Download our app on Apple OR Android! Many parents will have to deal with some kind of oral injury with their kids at some point. Teeth can cause quite a bit of pain if they are damaged, and are sometimes knocked out by accident! Did you know that The Kidds Place has an mobile app? On the app is a feature specifically designed for dental emergencies and will notify one of our pediatric dentists right away! Simply take a picture of the problem and upload it via the app. Take a moment to describe the issue and you won’t have to wait until the next business day to hear back. Here are tools you can utilize once the problem is identified before you notify a dental care professional. Clean the area of the affected tooth thoroughly. Rinse the mouth vigorously with warm water or use dental floss to dislodge impacted food or debris. DO NOT place aspirin on the gum or on the aching tooth. If face is swollen apply cold compresses. Take the child to a dentist. Apply ice to bruised areas. If there is bleeding apply firm but gentle pressure with a gauze or cloth. If bleeding does not stop after 15 minutes or it cannot be controlled by simple pressure, take child to hospital emergency room. Find the tooth. Handle the tooth by the crown, not the root portion. You may rinse the tooth but DO NOT clean or handle the tooth unnecessarily. Inspect the tooth for fractures. If it is solid and undamaged, try to reinsert it in the socket. Have the patient hold the tooth in place by biting on a gauze. If you cannot reinsert the tooth, transport the tooth in a cup containing the patient’s saliva or milk. The tooth may also be carried in the patient’s mouth. The patient must see a dentist IMMEDIATELY! Time is a critical factor in saving the tooth. What Age Should a Child Start Flossing? 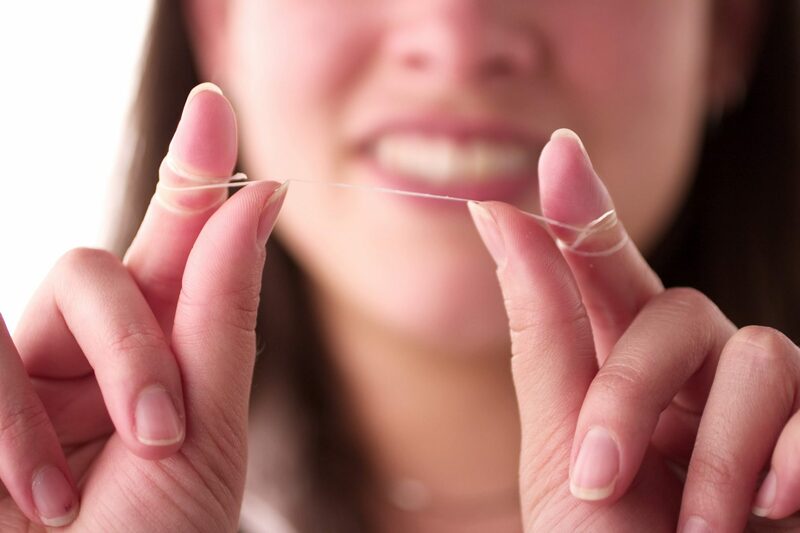 Do you remember the age you started flossing? Do you still struggle, as an adult, to floss daily? The truth is, some of our longest-lasting habits begin at a young age. Small tasks like combing our hair or tying our shoes begin in the earliest years, long before we’ve fully developed the strength in our hands to master them. For children, these serve as mile markers on their road to independence, as they should: learning these basic skills are those which they will use the rest of their life. Anyone who has kids knows celebrating these baby steps of development can be really special to watch unfold. Everyone has their firsts, right? Kids usually have all of their baby teeth by the time they are two years old. As their mouths grow, change, and new teeth begin arriving, the space in between closes up. Experts suggest that teeth come closer together anywhere between 2 to 6 years old; basically the time between a child gets all their teeth, and the age they typically begin losing them to larger, adult teeth. When your child’s teeth look like they’re touching, this is the time to instill the habit of flossing. Tight spaces can be a breeding ground for bacteria, which is a place a toothbrush simply cannot reach. 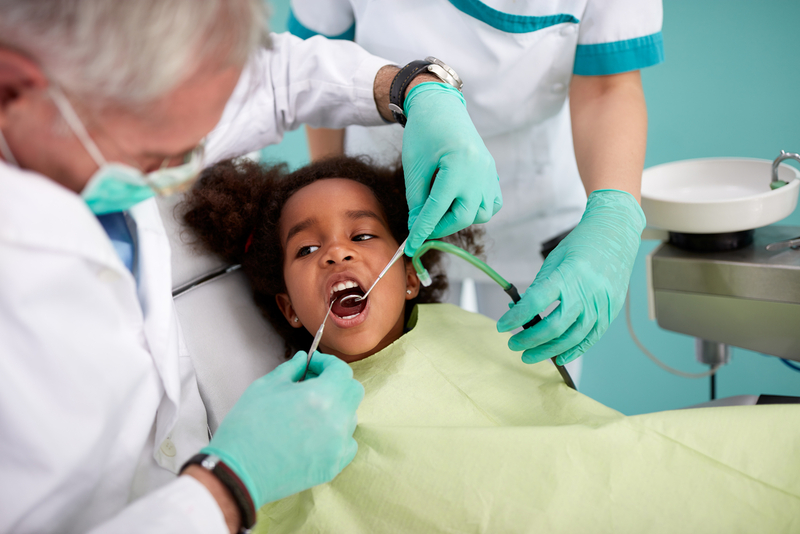 By age 2, it is recommended that a child has seen a dentist at least once. So if you are unsure about beginning to floss, ask your pediatric dentist at your child’s next appointment and they will be able to tell you when the time is right. Again, every child is different. Depending on how old, they may insist trying to floss on their own. But remember, even if they are almost 6 or so, they will not have the full strength and dexterity in their hands to floss properly until they are at least 10. Establish habits, and establish them early. You can do this by setting a good example and showing your child the proper technique before you do it to them. Start by taking a generous amount of floss (roughly 18 inches), and hold it at either end with both hands. Then, wrap your finger around towards the center, until there is about an inch of floss remaining. This is what you will use in between the teeth. Every few teeth or so, unwrap and re-wrap the floss so that the inch is at a different place in the floss. Once this is developed, it can become a part of a child’s routine, and they can become quicker at it so it is not seen as an incredibly time-consuming chore. If this is the case, flossing will be done less and less and become a thing of the past. This means bloody gums at their next dental appointment (more ouch!) and flossing will be that much harder to get back into. Set a good example, and teach your child to floss every day. It will be a skill they will carry with them the rest of their life! According to the American Dental Association, 4 out of 5 cavities occur in the many crevices of our molars. This can be predominant in children as they are not as experienced in cleaning their teeth. The grooved areas are what are known as “fissures”, and since most of our predominant chewing is done by our back molars, that means bacteria, food, and plaque build-up often occur in these areas. In adult teeth, the fissures are deeper than baby molars. When particles become trapped, they can accumulate bacteria and ultimately break down a child’s enamel, forming a cavity. Because some of these cracks are so minuscule, they may be difficult to reach by way of traditional brushing due to bristles not being thin enough or strong enough. Sealants are a protective, clear coating that protects these fissures from decay. As adult molars begin to erupt (usually at ages 6 and 12, but the time frame can vary) these sealants can be added to a child’s tooth prevent cavities from forming. They are applied by first cleaning a tooth using a rotating brush, and then rinsed with water. The tooth is then dried, so the sealant can adhere to the surface of the tooth. Once it is placed, the substance is then dried with a special curing light which causes it to set as a hard varnish. Then viola! The tooth can now be used normally for chewing. While it is not common, adults are known to have this procedure done for preventative measures as well. Invented in the 1970s, sealants have been known to be fairly effective. The average life span for a sealant is 5-10 years and can be re-applied if necessary. As long as the covering remains intact, it stays effective for the child and into adulthood as well. If a sealant is broken or becomes loose, it should be removed immediately by a dentist so that the procedure can be redone. Quick and painless, you cannot really go wrong with sealants! Apple cobbler, pumpkin pie, fudge brownies – oh my! ‘Tis the season for incredible sweets and frosted delights. Statistically, the average person gains anywhere from 7-10 pounds between Thanksgiving and Christmas – and no wonder! Sugary treats are an integral part of holiday tradition, and not just in the United States either. Sugar and even excess carbohydrates can cause harm to little teeth! Even if you do a good job of monitoring your child’s treat intake intake this time of year, there will be so many times exceptions are to be made. Family parties, cookie decorating with friends, and the constant aroma baked goods coming from the kitchen at grandma or auntie’s house. These various occasions take place virtually only once a year and with family members rarely visited. Whatever the traditions in your home, and the homes of your loved ones, these are often recipes that have brought family together for generations. Instead of bagging these traditions, you can always create new ones in the midst of them. 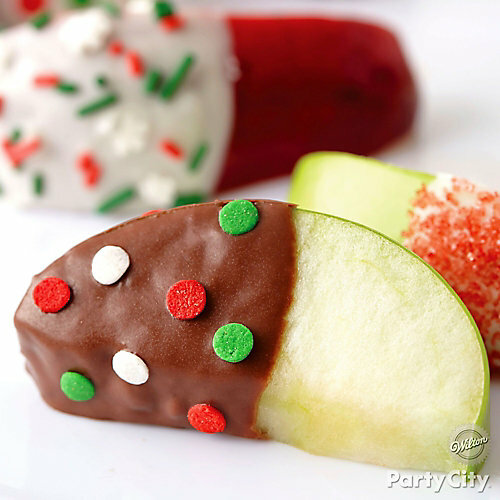 Here are some amazing, healthy, and fun foods to make – that are no less Christmasy! These can be excellent alternatives when you are unhappy with your number on the scale or concerned about your children’s constant “sugar highs” that they can be more prone to this time of year. Tiny marshmallows, green grapes, thin banana slices, and strawberries, arranged on a toothpick. Be sure to cut off the top and bottom in the strawberry, and use the scraps for a fruit salad to avoid waste! Makes for a great afternoon snack, and easy to eat on the go. Can be refrigerated for later. Ingredients: 4 pita folds or pita bread roughly 6” across, pretzel sticks (halved), ½ cup of fat-free sour cream, ½ cup guacamole, 2 tablespoons finely chopped parsley, ¼ teaspoon garlic-pepper blend, ¼ cup diced red bell pepper. First, be sure to toast each piece of pita bread, and then slice it into eighths. Insert pretzel sticks halfway through the bottom of each pita triangle. Mix sour cream, guacamole, parsley, garlic-pepper blend, and spread onto squares. Sprinkle the diced red peppers on top and refrigerate to store. 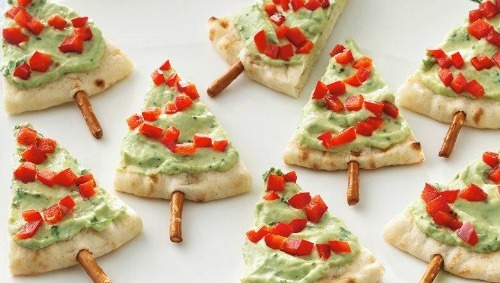 Pita Tree Appetizers – perfect for any Christmas party! Very simple, with so many variations! 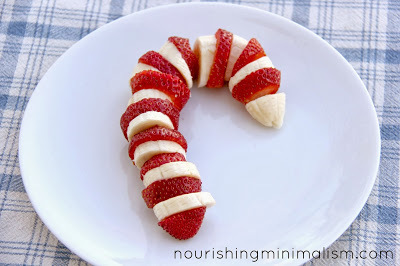 For a traditional looking candy cane, thinly slice strawberries and bananas at a slight angle. Keep rounded ends of each fruit and put them off to the side. Create a curved cane by alternating fruit and top each end off. Serve on a plate and enjoy! Totally straightforward! You will need pancake mix (whichever recipe you prefer), creamed whip in a can, strawberries, preferred bacon, and chocolate chips. Maple syrup optional. Create two round pancakes of different sizes and stack them as pictured. Then pour 2 ear-shaped tiny pancakes and set them to the sides of the bigger pancake. Take two full strips of bacon for the antlers, then cut a third bacon strip in half to “branch” off of the original antler. Add more if desired. For the face, spray 2 dollops of whipped cream and top it off with 2 chocolate chips to create the eyes. 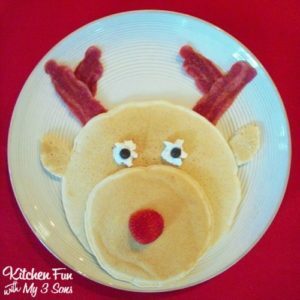 For the red nose, add a strawberry or raspberry at the center of the smaller pancake. Perfect for a Christmas breakfast! Cut green and red apples into thin slices. To prevent slices from browning, first add lemon juice. Take melted chocolate (or white chocolate) and dip each slice halfway, then set it on wax paper to cool. While chocolate is still liquid, add festive sprinkles to stick and harden. Arrange in a row or in a circle and serve! For more ideas, visit Pinterest and be sure to swap recipes with other moms! They will definitely appreciate the ideas to go easier on the sugar this year! It is not every time that we use our mouth for something that we ask, “is this actually okay for my teeth?” Whether it be eating, speaking, gum chewing, or holding something in our mouth while our hands are full, what can we absolutely afford NOT to do? 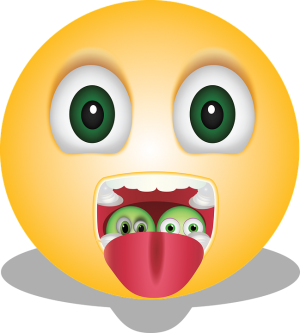 Our most prominent orifice, the mouth is not only one of our primary forms of expression (speaking), but how we receive over 90% of our nutrients (from food). If you are going to take extra care of one area of your body, make it your chomper! Did you know that almost every fatal disease has an oral symptom? Both the mucous lining and saliva glands work together to keep the mouth lubricated and the absorbing qualities of the mouth tissue alive. What is then gleaned from lamina propria (the connective tissue) is absorbed through what is called the facial vein. This means that whatever properties go into your mouth can enter into your bloodstream without even having to be swallowed. Here are some simple things you can avoid doing to protect your pearly whites. Encouraging your children to do the same and stopping bad habits now (especially nail-biting) may save a lot of grief down the road. Although most of these do not cause immediate harm, many can affect your smile over time. We have already talked about a lot of these habits in previous articles, so feel free to click on them for further reading. Bruxism is just the scientific word for teeth-grinding. Despite the fact that tooth enamel is the hardest substance in the body, it can obviously still wear out. This can be attributed to the fact that the human jaw is incredibly strong – up to 150 lbs of power! If you are in the habit of grinding your teeth every night, this can eventually take its toll. Those who are diagnosed do not know they even had the condition until a parent or spouse tell them. Talk to your doctor about a mouth guard that repositions the jaw so that air is still passing through. Often bruxism is caused by not being able to breath properly during sleep. The most common symptoms are molars that appear to be worn down, as well as jaw and tooth pain. If the problem persists, talk to your doctor or dentist and they will have a preferred solution that they would recommend. This could mean acid contact firsthand; found in consumables like soda pop, citrus fruit, coffee, or even stomach acid if you suffer from heartburn or are prone to vomiting. Acid wears down the enamel, the outer protection of the teeth, which can cause cavities and decay. However, eating sugar and carbs excessively and neglect can do this as well. Why? Because when these particles come into contact with saliva they break down into glucose and fructose. This gradually turns to plaque if it is not brushed away, which can also cause decay. Very common in infants, prolonged thumb-sucking as well as extended use of a pacifier can cause teeth to grow in crooked. 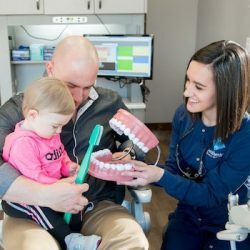 Although doctors and child care professionals disagree on the best time to wean these habits, it all comes down to whether or not it is negatively affecting baby teeth in their growth. Baby teeth create a “path” for adult teeth to grow in. If they are misaligned, so the adult teeth can be. It may seem harmless, right? Regardless of the fact that it is sugar and carb free, ice is still an incredibly hard substance which, when chewed can cause chipping or damage to existing dental work. Doctor Richard Price of the American Dental Association on the matter of chewing ice reminds us that “even your blender needs special blades to crush ice. Do not pick at your teeth with any sharp, metal or otherwise hard object (toothpicks and things of that nature are fine, as long as they do not hurt your gums). It may seem like a no-brainer but only the dentist should be poking around with a periodontal probe or dental hook. These are stainless steel and can cause serious harm. Dentists have special training in this, so don’t try this at home! Doctor Price also says, “Teeth are not pliers, teeth are not hooks.” Out of sheer laziness we commonly rely on our mouths to do a job that would require reaching for the scissors or into the toolbox to do. This cannot only cause chipping, but cracking as well which can be very painful. Our teeth are not designed to bit and clench down on hard plastic or metal. This also goes for nail-biting as well! If you tend to go a little heavy-handed on the brushing, you may need to invest in a toothbrush with softer bristles. These usually cost the same as a regular toothbrush. Brushing too hard can irritate the gums and even wear down enamel, leading to more issues down the road. The bristles dragging across the gums repeatedly can cause small abrasions on the gums which can also get infected and cause sores. While these seven appear to not be of any issue at first glance, they can definitely cause problems if made a regular occurence. Be aware of these and be on the lookout for your children potentially developing these habits. It is all to maintain a lifelong, healthy smile! How Does My Dental Health Affect the Rest of My Body? When taking care of our mouths (and our children’s!) it is important to understand how having a healthy mouth contributes to one’s overall quality of life. Good diet and exercise are vital ingredients to a strong body; in the same way brushing and flossing are a recipe to secure a lifelong smile. Gums have absorption qualities that our skin does not. This is why when chewing tobacco is placed in the inside of the cheek or lip, the nicotine is absorbed through the gums and into the bloodstream, making it addictive. What many people do not realize is anything that remains inside the mouth has the potential to be absorbed into our blood, even if it is not swallowed. Harmful bacteria left behind from plaque and gingivitis is often culprit of infiltrating our blood and causing a lot of problems. This is why periodontitis (gum disease) and cardiovascular (heart) disease are directly correlated. Plaque between the teeth builds up to the point of being absorbed by gums causing infection and inflammation. This can cause hardening of the arteries or even infection in the lining of the heart itself, which is called endocarditis. Not good! Because we breathe through our noses and mouths, oral health affects respiratory health too! Just imagine breathing in microscopic particles of decay-causing bacteria directly into your lungs over a long period of time! Pneumonia can be developed from continual exposure to harmful bacteria. In some cases, gingivitis and later periodontal disease are known to cause dementia and Alzheimer’s. Harmful bacteria can be received by the nerve receptors in the head as they travel through the bloodstream. It is also for this reason that gum disease can affect your blood sugar and people with diabetes as well. Despite the fact that these ailments are primarily found in the elderly, it goes to show that you will never stop taking care of your teeth! A tooth is the only mechanism in the body that cannot heal itself! If anything, as our bodies start to deteriorate as we age, we must be relentless in the care of our mouths – it is our source of speech and communication, receives most of our nutrients (through eating), and enables breathing far more than the nose. As you can see, mouths are a unique part of our body because they are responsible for so much. Our main orifice and also the most exposed – the mouth requires a meticulous grooming that is entirely its own. Medicine has come so far in 2016 that practicing doctors hundreds of years ago would have never imagined. Although, even the cultures considered more primitive in ancient times had some concept of the importance of oral care. It is therefore universal that the care of the oral cavity is caring for the entire well-being of the body. Who knew that ignoring dental problems could create such problems down the road? You may never have considered how paramount keeping regular dentist visits and developing a proper daily dental hygiene regimen could be. Save your smile – save your life! Have you ever had a canker sore? They are not fun, and can appear at the most random and inconvenient times! What is more, it can make simple tasks like eating and brushing pretty painful. Nearly everyone has experienced at least one canker sore in their lifetime, and they are definitely a pain in the mouth! Usually identified by a small, round white bump with redness and tenderness surrounding it, they are classified as small, shallow ulcers. These sores are much different than cold sores and can last up to a week. Canker sores are not caused by any one thing, nor do they target any specific gender or age group (although they do seem to affect those between the ages of 10-20 more). Statistics say that 20% of people report having one at least once a year. So while they do not appear to be a constant occurrence, what does cause them? Random sores appearing can usually be traced back to a small abrasion in the gums or the mouth. This can be caused by a dental instrument, accidentally biting your tongue or cheek, or brushing too hard. Sometimes these wounds are so minuscule they go unnoticed. From there the minor cut or scrape can become infected with oral bacteria which forms a sore. Canker sores can also appear in times of emotional stress, certain hormonal changes, and even sensitivity to foods containing acid and citric acid like oranges, lemons, tomatoes, strawberries, coffee, etc, which can erode the inside of the mouth. It can also come from vitamin deficiencies in your diet, such as vitamin B, zinc, and iron. Wait, Aren’t Cold Sores the Same Thing? Nope! Cold sores are caused by the herpes virus and are incredibly contagious (luckily, canker sores are not). They also occur on the outside of the mouth, whereas canker sores only appear on the inside. Cold sores are commonly referred to as “fever blisters” since they usually are accompanied by illness. Prior to the cold sore developing there is usually some redness and tenderness where the outbreak will be. Children with cold sores typically experience more severe sickness than adults. They are so named “blisters” because the cluster of painful bumps that form burst after a couple of days. They can last significantly longer than a canker sore and be of course more noticeable than one too. Natural home remedies can include swishing with mouthwash or saltwater. Both will help to disinfect and dry up the sore, speeding up the healing process. Natural aloe vera and black tea bags can both cure canker sores when applied directly. Despite the fact that canker sores tend to almost resemble pimples, they should not be popped or poked with a needle. This can cause them to worsen or spread. If you have an outbreak of two or more canker sores at a time and they do not go away on their own and persist after a few weeks, be sure to see a doctor for a specific remedy or even prescribed medication. If continual canker sores persist, try switching to a softer bristled brush to reduce abrasions in the mouth. If you suspect the sores could be diet related, reduce the amount of acids and citric acids you consume. Did you know that every 3 out of 4 Americans experience a form of gum disease in their lifetime? Gingivitis, the most common, is a condition that encompasses the very early stages of a more severe gum disease or periodontitis. It is most quickly recognized by bleeding when flossing or brushing. Gingivitis is the number one cause of bloody gums, and should not be ignored as it is not a “normal” thing. Perfectly treatable early on, it can lead to a more serious condition (periodontitis) if neglected. Plaque is essentially a hardened film that develops on teeth, formed by bacteria. Plaque grows wherever bacteria is not being removed; which means if you do not floss, you are not getting rid of the bacteria in between your teeth! Did you know that a toothbrush only reaches 2/3 of our mouths? That means, if a person never flosses, one third of their mouth never gets clean! Gross! The plaque that grows between teeth release toxins into the gums which can cause an infection to develop. The infection spreads into the gums, making them red and tender. This means if you brush a little too hard one day, or floss for the first time in awhile, it can cause an instant abrasion in the gums, causing them to bleed. Gingivitis is very prominent in children as they are still developing healthy oral hygiene habits. They are notorious for cutting corners in their daily brushing regimen. Typically children also have more of a taste for sweets. Sugar turns to acid, acid turns to plaque, and plaque seeps into the gums, causing the infection. 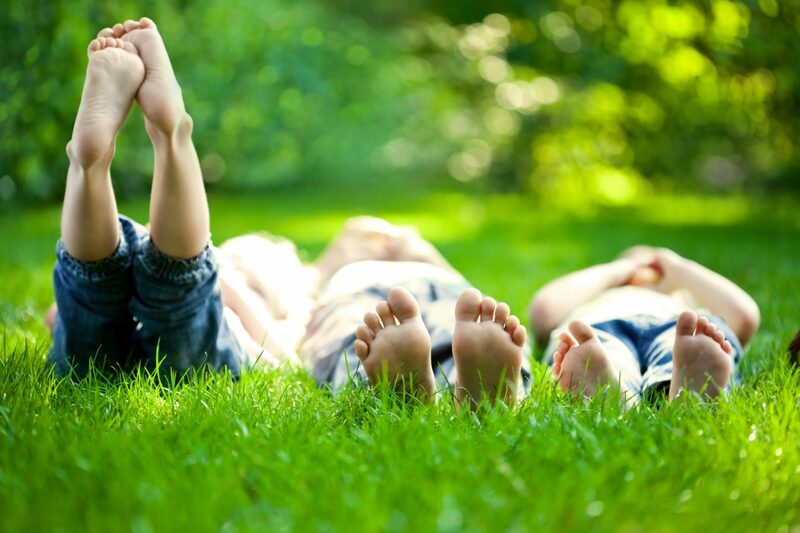 Children and young teens are also at risk because rapid hormone changes are known to be linked to gum disease. 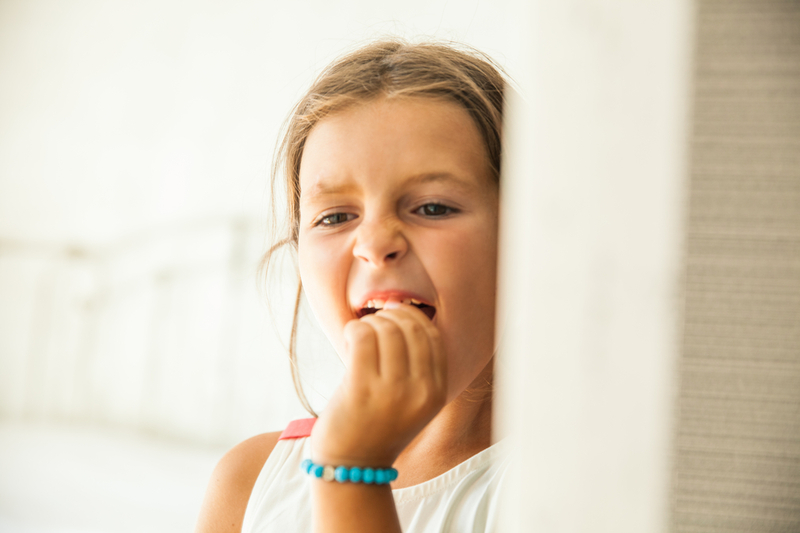 Bruxism, or teeth grinding, is also more common with little ones, which can worsen gingivitis and is hard on the enamel and overall teeth in general. All things to be considered; that children are constantly growing and developing and that taking care of their teeth at a young age will do them favors and save them a lot of trouble later in life. If your kids start to see that “pink in the sink”, definitely help them out! There is a statement among experts that say children do not have the proper dexterity in their hands to brush their teeth until they can tie their shoes all by themselves. Therefore it is recommended you brush your child’s teeth for them up until the hand strength and precision is developed. Small flossers are also useful to assist you with flossing and it will also teach them to do it on their own. Flossing is probably the number one thing you can do to prevent gingivitis from happening in between the gums. Be a good role model and take care of your own mouth too. This means brushing twice daily for at least two minutes, and flossing and rinsing once daily. If your child’s gingivitis condition is more severe, it may be a good idea to arrange for them to start going to a pediatric dentist, as they have more experience with little mouths and have 2-3 years more schooling than regular dentists. Teach them young, and take care of their teeth now so they do not have problems with their adult teeth later! Why We Grind Our Teeth: A Lifesaving Mechanism? Mouth grinding is a habit that occurs during deep sleep, meaning many may be unaware that they even do it. Usually it takes a spouse or a loved one of someone that grinds their teeth to be able to notice it in the night. Also known as bruxism, this is a condition that can go unnoticed for long periods of time and is more common in children than adults. Symptoms may include but are not limited to: tooth pain, jaw soreness or clicking, molars appearing to be worn flat, enamel wear, and headaches. Chances are a dentist will be able to perform an examination to tell whether grinding is occurring. It is reported that over 10% of adults and 15% of children grind their teeth; yet it was not until recent years that doctors have actually discovered why. It used to be a common misconception to link bruxism to stress or anger in the same context as we feel it during the day. Naturally, it can be a natural human response to consciously clench our teeth when we are mad or feeling intensely about something; and while this can happen while we sleep, it is found to actually be more than likely linked to what is called “obstructive sleep apnea”: a disorder that cuts off breathing for anywhere from 10-30 seconds during sleep. While we sleep, we drift in and out of REM and NREM cycles. These stand for “Rapid Eye Movement” and “Non Rapid Eye Movement” which represent the depth of the levels of which the mind and body rest. As our sleep and rest deepens, all of our muscles relax completely. This includes the neck, jaw, mouth, and tongue. Now, when all of these muscles are completely slack it can actually block the opening of the trachea, closing off our airways! To counteract this, the body is brilliantly designed to begin grinding. Why? Clenching the jaw is our body’s natural response because it tenses up muscles just enough to clear whatever is preventing air from freely passing through. When the muscles tighten, it reopens the airway! The sudden obstruction, grinding, and then release unfortunately pulls us out of that deep sleep cycle and into the first stage of NREM (the lightest sleep), disrupting the cycle without the person perhaps even realizing it. Despite the negativity surrounding bruxism, it is true that is could very well be preventing this form of sleep apnea and allowing air to pass through to the lungs even in the deepest sleep. Mouth guards might seem like the best solution but in truth can actually make breathing more difficult. It would treat the symptom (teeth grinding) but it would not solve the initial problem. If your teeth grinding is becoming more of an issue, talk to your doctor about sleep apnea. When REM occurs, it is in the stages of the night where our skin and brain cells are replenished, our HGH (human growth hormone) is released, it boosts memory, and helps us burn fat. Sleep apnea disrupts this cycle which can lead to weight gain, heart disease and stroke. Children with sleep apnea were reported to struggle with hyperactivity, lack of focus, issues communicating, trouble adjusting to new environments, and in general received lower grades. Remember, just because you are getting an 8-10 hour rest does not always mean that this it is a wholesome, uninterrupted sleep. The good news is that most children outgrow their sleep apnea as well as their grinding, leaving little to no lasting damage on their teeth. In a recent study, patients were given a CPAP machine (a treatment often used in severe cases of sleep apnea) or an oral device used to adjust placement in the mouth to make breathing easier. Not only did their sleep apnea stop, but so did the bruxism. Check for signs of your children grinding their teeth – chances are if it is a regular occurrence, they are not getting the sleep they need. While grinding our teeth could be saving your life every night, it can have a long-term effect on one’s overall health. If you are concerned your child may have obstructive sleep apnea, or you yourself have it and you are concerned about your long-term health, talk to your doctor or pediatrician about steps you can take towards treatment. If the grinding persists and there is a legitimate concern about worn-down enamel, talk to your dentist about a safe mouth guard he or she would recommend.